These projects involve drilling a lot of holes. There are many options for the sizes of holes you drill and even a couple of options for how you drill them. In general, the size you select for the outtermost hole dictates the sizes of the rest of the holes you have. You need to ensure that you have enough surface area on the balls to accomodate your holes and still hold together well. Typically, you're concerned with the largest and smallest holes - these often dictate the size of other holes. Descrete bits & the crown hole cutting tool - If you use the crown tool to cut the primary holes you only need one bit for the primary holes. Many people find that the crown hole cutter makes the hole in the 4th ball a bit too large at 3/8". For me, the math just doesn't work out correctly for the size holes it cuts. I don't use the crown hole cutting tool. 1-level ball - On some projects you'll only have the outtermost ball. 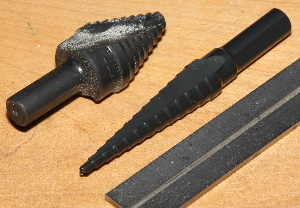 For these, I often use a 7/8", 3/4" or 1" bit. A 7/8" primary hole looks good with a 1/4" satellite hole. When I use a 3/4" primary hole, I prefer a 3/8" satellite hole. Multi-level balls - When making a ball with 2 or 3 spheres, you have many options for hole sizes. I select my sizes based on a chart I made. I did some simple trigonometry to determine the hole sizes relative to other holes sizes. It all made sense to me at the time and I find that it gets me close. You can download the chart here. Primary holes: 3/4", 9/16", 7/16" and 1/4"
Satellite holes: 3/8", 1/4", 5/32" and 1/8"
Personally, I don't think it works very well to cut more than 2 levels with individual bits. Step bits - Fortunately, there's a better way to cut the holes in a 5-level ball. There are several different step bits available that will cut all the holes with one bit. Greenlee makes 'Kwik Stepper' step bits that are the size we need. You'll need the Greenlee 34411 for the primary holes (plunge to the last shoulder for a 3/4" outside hole and 1/4" smallest hole). They also make the 34401 for the satellite holes. Using the step bits make the process much quicker, but you need to be very careful with the cutting depths. Another limitation of step bits is the ring they somtimes leave on the inside of the holes they cut. These can often be removed with some quick sanding, but be aware that its a trade-off.